In the long term, New Zealand is facing an increase in population numbers and proportions at the older ages, specifically for those 65+ years. Statistics New Zealand National Population Projections reflect a 90% probability that people aged 65+ years will make up between 21-26% of the approximated 6million strong population in the year 2043… or roughly 1.32 million people, 240,000 – 280,000 of whom will be aged 85 years and up. In addition to this, nationwide research conducted independently by Metlifecare in November 2016, indicates that more than 68% of Kiwis over 45 years old would consider moving to a retirement village at some stage in their life. Now obviously my coffee-table calculations are neither precise nor sensitive to the multitude of environmental factors that could affect such demand, and in no way do I claim to be qualified or experienced in the mapping or projections of socio-economic population trends. A more professional opinion than mine could be found in the New Zealand Retirement Village Database (NZRVD) Whitepaper that is published annually by Jones Lang Lasalle (JLL). 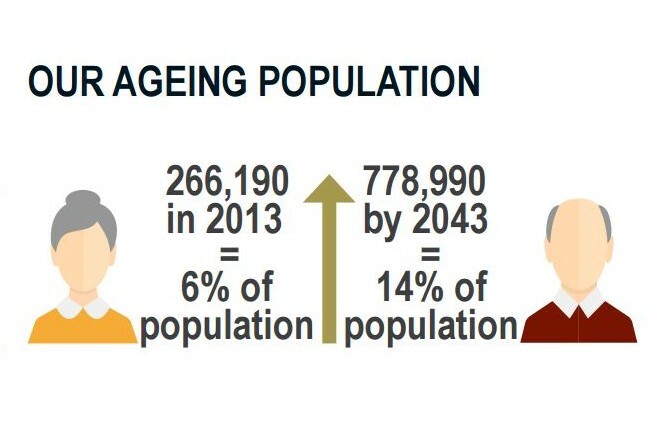 In their 2015 report (at the time of writing this I could not find a newer edition), JLL had based their figures on a population aged 75+ years in 2043 totalling 778,990 and a ‘best case scenario’ market penetration rate of 16%, equalling a much-more-conservative but still-the-size-of-a-small-city 124,638 residents. Even with the massive drop in perceived demand from 68% to 16%**, JLL has forecast that the construction industry will need to provide an average of somewhere between 11 to 15 new villages per annum – or 2270 new units -between 2018 to 2043 to keep up with the increase in projected demand. And that’s actually quite a lot. This ageing baby-boomer phenomenon is not unique to New Zealand by any measure and is currently being anticipated and discussed by economists, statisticians and sociologists throughout the developed world. However, reasons given for the upswing in popularity of Retirement Villages in comparison to previous cultural norms appear to be a combination of three factors. Firstly, an increased geographic scattering of modern families which has separated the elderly from their adult children, who would otherwise house them; secondly, a sustained increase in the amount of females in the workforce who are not available throughout the day to look after grandparents; and finally an overall increase in health and longevity of developed national populations. Regardless: there is a huge and ongoing demand for construction professionals within the Retirement Village industry – and it’s likely to stay that way for at least another 27 years. So if you’re a building design or construction professional, and interested in anything you’ve read above – tell me about it. Opportunities are everywhere… (but especially here). *This was an outrageous sum, please don’t take me too seriously.